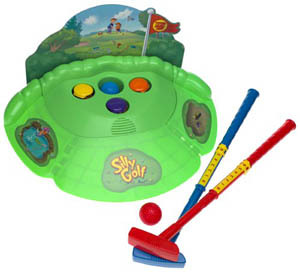 The Goofy Gopher Golfing game from Milton Bradley. Reviewer: The characters voices and comments are very funny. When the little Gophers go down in thier holes they talk as if in a cave. They seem to have endless sayings. Has a little bit of assembly, but not too hard. It was easy to play and the kids had lots of fun. The toys is made of really high quality plastics and should last a long time.